Software which uses the J-Link DLL to include J-Link support (e.g. IDEs), can implement an option to specify a J-Link log file. As this is no must, the J-Link log file can also be set / overwritten using the J-Link Control Panel. This allows to create a log file independent of the used software. Please note, right now the J-Link Control Panel is available in the windows software package, only. The override option can be used in any application to create the J-Link log file as it is a global override. The J-Link logfile can be enabled by passing the -Log <Path> command via command line option to the J-Link Commander. The J-Link logfile can be enabled by passing the -log <Path> command via command line option to the J-Link GDB Server. 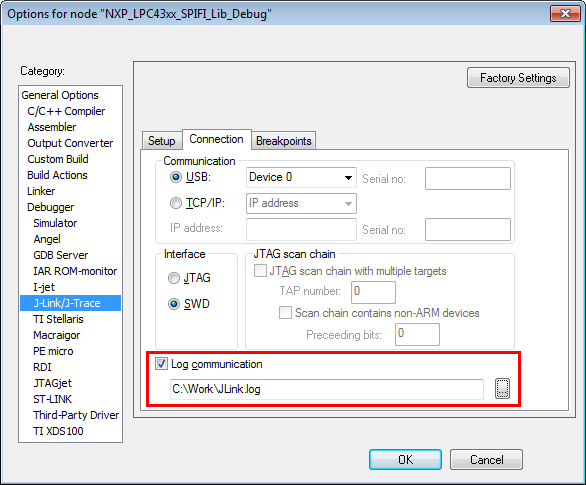 The J-Link log file can be enabled using the User Actions function int Project.SetJLinkLogFile(const char* FileName);. We recommend to add this function call in the OnProjectLoad() project function. For further information regarding this, please refer to the Ozone User Manual (UM08025). Open the project options Project --> Options and switch to the J-Link / J-Trace --> Connection tab. Check the Log communication checkbox and enter a path as in the screenshot below. 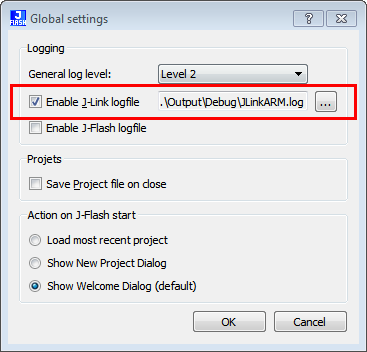 The J-Link log file can be enabled through a separate J-Link DLL API function. For further information regarding this, please refer to the J-Link SDK user manual. Please note that this manual is available for users with a valid J-Link SDK license, only. This page was last modified on 22 January 2019, at 10:40.